Store fruit in the refrigerator, if appropriate, especially if there is an active infestation. Immediately dispose of damaged or over-ripe fruit. Once a banana skin has turned black, it’s time to say goodbye. Regularly clean counters and empty the kitchen trash bin; don’t let food collect even if the bin has a sealed lid or it is kept under your sink. Keep after your kids to either clean up spills or at least report them to you. Keep drains clean; they are an overlooked breeding ground. Using bacterial digesters can help. Small flies or gnats hovering around decaying fruits and vegetables in your kitchen or around trashcans are probably fruit flies. Fruit flies are a problem year-round but are especially active during harvest time (late summer and fall) because they are attracted to ripened or fermenting fruits and vegetables. Ripening and fermenting are steps in the process that leads to rotting, a decomposition of food caused by mold growth. Spoiled food smells because the bacteria and fungi release certain chemicals. While humans naturally dislike these smells, fruit flies are attracted to them. Ripening, fermenting or rotting tomatoes, melons, squash, grapes, bananas, potatoes and onions – pretty much anything perishable – are fruit fly magnets. Fruit flies are at most 4 millimeters (5/32 of an inch) so their individual features are not easy to see; they are brown or tan in color. 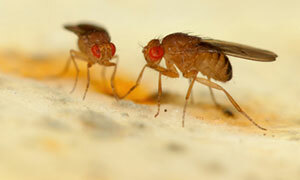 They reproduce rapidly: Fruit flies can lay about 500 eggs during its 30 days of life. The entire lifecycle from egg to adult can be completed in as little as a week. Fruit flies can infest any space from small kitchen apartments to large grocery stores or restaurants, wherever there is organic material that ripens or ferments, and eventually rots. While attracted to their namesake, ripened fruits, and vegetables, fruit flies can breed almost anywhere. All they need is a moist film of organic material. Common breeding grounds include drains, garbage disposals, empty bottles and cans (especially if they contained beer or liquor), trash containers, mops and cleaning rags, and even grease traps used in commercial kitchens. In homes, infestations are often traced to soda or juice spills, a rotting potato or onion forgotten at the back of a shelf or some food that has found its way underneath a refrigerator. If you have a severe or persistent fruit fly infestation, a pest control professional can utilize several control treatments. With treatments and removal of food sources, the fruit fly population will die out. Flies are a nuisance that shouldn't be ignored! Still looking for additional information? Check out our in-depth fly technical papers by clicking the "Learn More" button! A blow fly infestation is usually a Blitzkrieg invasion: huge numbers of flies suddenly appear inside the home all at once. The suddenness and severity of the infestation can make homeowners distraught, and rightly so. 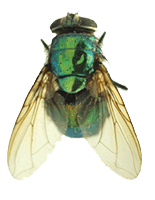 Blow flies are large flies that look somewhat like house flies but are a shiny, metallic green, blue, bronze or black. Males have feathery hairs on their antennae. They tend to congregate around windows, making an annoying audible buzzing sound. During New Jersey winters, flies are not active; these infestations only occur during warmer months, especially during summers, when flies are active outdoors. In nature, these flies help to promote the decay process of animal carcasses; they are the “first responders” of insects arriving within hours or even minutes after an animal dies. Their maggots eat the animal’s flesh and are responsible for much of the decay. Forensic entomologists even use blow fly activity in homicides to estimate time of death. Unfortunately, a blow fly infestation suddenly appearing inside a home means that one of these unpleasant sources is nearby the home, whether an animal carcass or decaying waste material. A common cause is a break in a sewer pipe; sewage is seeping beneath a cracked pipe is a blow fly attractant. If the flies are limited to a specific location, especially a bathroom, a plumber should be hired to check the underlying pipes for cracks. Another possibility is garbage. During the summertime, these flies can lay eggs in meat and vegetable scraps in your trashcan, going through an entire generation in less than a week. When fly maggots finish feeding, they often crawl away and pupate in dark, secluded places. Sometimes these maggots or pupae find their way inside a home. Vacuum them and discard the bag. Those that are missed will emerge later as flies. Finally, a dead animal carcass will produce a swarm of flies. One common source is a mouse that has died inside the walls or behind an appliance. Of course, any nuisance wildlife, like a squirrel, bird or raccoon that dies in the chimney, crawl space or attic, can be a blow fly food source. The bigger the carcass, the more maggots and flies, but even a small mouse carcass can produce a mind-boggling number of blow flies. Sometimes it is impractical to find and remove the dead animal, especially when it is inside the wall. Fortunately, blow flies do not feed indefinitely; they only infest “fresh” cadavers so a carcass is only a good food source for a short period of time. However, there is a risk that various types of beetles may show up later after the corpse has dried out. To eliminate blow flies, you need to eliminate the breeding/feeding source so sanitation is important, just like with controlling any fly infestation. Exclusion, making it more difficult for the flies to find avenues of entry, is also important. Keep window and door screens in good repair, use weather stripping and caulk gaps and cracks to reduce the chances of fly infestations. Blow flies are especially attracted to the light from windows during the day so fly strips are a good non-toxic method of capturing them. Make sure your draperies or window treatments are securely tied back so the fabric doesn’t get “stuck” in the sticky tape. Finally, we would be remiss in not mentioning the traditional flyswatter. It takes work, but many feel a sense of satisfaction employing their stealth hunter instincts to corner and kill the flies. Do not use swatters in food preparation areas; swatters may have fly remnants and can be a source of contamination. Contact Cowleys Pest Services today if you have ongoing fly issues or heavy infestations in your home or business. We can eliminate the pests from your home or business, as well as prevent any future re-infestations. 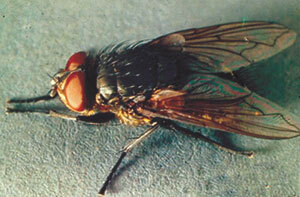 Cluster flies closely resemble house flies, but they are larger and have yellowish hairs on their abdomen. Cluster flies are somewhat unusual in that they are the parasites of earthworms. So, the more abundant earthworms are in your area, the more likely that cluster flies will be a nuisance. Where can you find plenty of earthworms? Just go to places where manure is being piled or stored like at farms. But you can find high earthworm populations in an area that has good soil and ground moisture. In the late summer, adult cluster flies search for overwintering sites. Some are outside like loose bark, holes in trees or other crevices and cavities. The sites that concern us are the indoor overwintering sites – attics, lofts, wall voids, loose-fitting vinyl or aluminum siding and other places inside our home. The flies may enter homes as early as the second half of August. As do all overwintering pests, cluster flies seek heat once they start to become exposed to colder temperatures. These flies can become a nuisance in the middle of the winter, as well as spring and fall when warmth or light lures them into our comfortable home temperatures. During the summer, cluster flies are not a problem; they are busy searching for earthworms. The best way to control cluster flies indoors is through the usual exclusion methods to keep out insects such as closing gaps and cracks and putting screening over attic soffit vents. Since these flies are attracted to light, you can get them out of your attic by opening the attic windows on sunny days. The use of a vacuum cleaner is a quick and effective means of reducing a cluster fly population in the home. Cluster flies do not bite people or animals. Also, unlike most other flies, they are not attracted to garbage or waste and a cluster fly infestation does not result from sanitation problems. Also, if you happen to like fishing, these flies are a good indicator that you can find a juicy supply of earthworms not too far away! 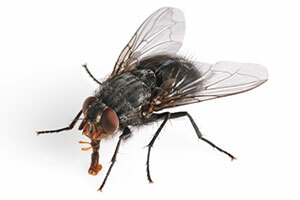 The average adult house fly lives up to four weeks in the summer and even longer in the cooler fall and winter months. There are few insects that are more of a nuisance than flies. Once flies enter a structure, their buzzing becomes a major distraction and that creepy sensation when one lands on your skin difficult to ignore. When there is food being served, it can be even more annoying trying to set up your own Iron Dome Missile Defense System to keep the flies from landing on the food. But flies are more than an annoyance. They can be a serious health hazard. Flies cannot bite but are capable of transmitting disease to humans and animals. House flies first regurgitate their saliva to liquefy the food; they then soak it up with their sponge-like mouthparts. The problem is that each time a fly comes to rest on an area, it quickly regurgitates and excretes on it. By leaving its saliva and excretions on food, flies are capable of transmitting a host of serious diseases. House flies are most active during the day, particularly on warm summer days. This is not pleasant to say, but house fly populations are heaviest when moist feces, decaying food and decaying organisms are present. Eliminating these conditions will reduce your chances of a house fly infestation. Ensure that your window and door screens are in good condition and that doors remain closed quickly after entering or exiting your house. Ensure that there are no decaying rodents lying around your home. Check mouse traps often and dispose of them quickly before they attract flies. Keep compost piles away from your home. Ensure garbage is picked up promptly at the curb. Be cautious where you clean out your garbage pails, even rinsing and dumping the waste into your lawn may attract flies to that area. Put food away promptly; dispose of scraps immediately after a meal. Seal cracks and crevices around windows, doors and outdoor pipes and vents. Store garbage in a pail with a sealed lid. Do not leave out meat products at room temperature, bacteria can grow to dangerous levels and risks fly contamination. Clean up pet waste in your backyard immediately. A simple fly swatter can be very effective in controlling flies. However, do not to use them near food or food preparation areas. Used swatters, containing fly remnants, can harbor dangerous bacteria and contaminate an area. For ongoing fly problems or heavy infestations in your home or business, especially restaurants and other food storage and preparation businesses, contact Cowleys today. We will eliminate any type of fly or insect from your home or business and, just as important, identify and correct the root problems in order to prevent future re-infestations.